When Geoffrey and Katharine's plane arrives at the desert base camp of the Royal Geographical Society's team of map-makers (who call themselves 'the International Sand Club'), the whole team travel in a truck to greet them. However, Almâsy remains behind with the truck and watches from afar. The same frame heuristic is relevant in describing this moment, as the whole team plus Katharine and Geoffrey are portrayed in one shot, and Almâsy is shown alone in another shot. Because he remains aloof, he is introduced to Geoffrey, and then Katharine, in the following scene. The scene consists of 17 shots and lasts 60 seconds. Almâsy appears in eight shots, including the opening establishing shot, and Katharine appears in seven (she does not appear in the opening shot). Other people appear in the first five shots featuring Almâsy (1, 2, 4, 6, 8), which means he is isolated in his own shots as the scene progresses (shots 10,12, and 16). Katharine is never isolated in her shots, for she appears in the frame with other members of the team, and with her husband (in shots 15 and 17). Towards the end of the scene, the discussion centres on different types of love. In shot 15 Geoffrey mentions his favourite type of love -'excessive love for one's wife', and then kisses Katharine. In shot 16, Almâsy turns away and says, 'There you have me.' This could have been a justified end to the scene. But shot 17 is added, almost an extra shot that lingers on Geoffrey and Katharine. Geoffrey simply smiles after his comment, while Katharine turns her head away with a bemused, or perhaps embarrassed, smile. This extra, lingering shot emphasizes in purely visual terms possible differences between Geoffrey and Katharine on the subject of love. Although they are depicted in the same frame, Katharine's gestures indicate possible discord between her and Geoffrey. But perhaps another heuristic takes precedence over the same frame heuristic. The editor of The English Patient, Walter Murch, has written: 'by cutting away from a character before he finishes speaking, I might encourage the audience to think only about the face value of what he said. On the other hand, if I linger on the character after he finishes speaking, I allow the audience to see, from the expression in his eyes, that he is probably not telling the truth, and they will think differently about him and what he said' (Murch 1995: 67). In the scene under discussion, shot 17 represents the lingering moment after the talking is over. The scene could well end on shot 16, cutting immediately after Almâsy's admission that he is unmarried. Shot 17 can be understand it in terms of the commentative heuristic of foreshadowing, for it consists of a moment of cinematic elaboration that foreshadows the future ménage à trois. In the following scene of Geoffrey and Katharine flying in one plane, and Almâsy and Madox in the other, there is a significant exchange of looks between Katharine and Almâsy. Katharine looks up toward Almâsy, who looks and waves back. However, Katharine simply looks at him for a moment before turning away, refusing to acknowledge his wave. The next exchange between Katharine and Almâsy takes place around the camp fire. Each character entertains the others in various ways. Katharine recites the story of Gyres, from Herodotus' History. The story in effect is about a ménage à trois involving the husband's murder and the lover taking his place. As Katharine recites the story, a slow tracking shot gradually unites her and Almâsy in the same frame, with Almâsy in the foreground and Katharine in the background. However, the shot is constructed using selective focus, with Katharine initially in focus and Almâsy out of focus. But as Katharine recites '... and she [the Queen] was more lovely than he [Gyres] could have imagined' she looks towards Almâsy, and the focus is pulled so that Almâsy is now in focus, and Katharine out of focus. The focus is reversed a few moments later, when Katharine recites the part of the story where the Queen realizes Gyres is watching her: '... although she said nothing, she shuddered.' Katharine then pauses as she exchanges a gaze with Almâsy, depicted in a quick shot/reverse shot pattern. The shot of Katharine in focus in the background, and Almâsy out of focus in the foreground, is repeated a few moments later, as Katharine recites that Gyres must kill the king and take his place. The shots, selective focus and editing do not simply depict the events, but offer commentary. They function to relate the events being recounted to the as yet unspoken events currently unfolding between Almâsy, Katharine, and Geoffrey. The same-frame heuristic can be used to explain how pull focus works to separate Almâsy and Katharine in the same frame (they are not in focus at the same time, and the quick shot/reverse shot separates them further). And the commentative heuristic can be used to explain how the action and film discourse are united, or how the film discourse transfers the meaning of the recounted story to the current events. The next significant shot depicting the ménage à trois occurs in the hotel, where the Sand Club meet up and toast the absent wives of the other members. Katharine proposes a toast to Almâsy. Looking at him, she toasts future wives. As she does so, there is a cut to Almâsy in the background of the shot, but in the centre of the frame and in focus, with Geoffrey and Katharine in the foreground at the edge of the left and right frame, and out of focus. Geoffrey turns to Katharine and raises his glass, while Katharine's expression remains hidden, and Almâsy looks off-frame, clearly uncomfortable with Katharine's comment. Geoffrey's expression suggests that he is still ignorant of the sexual attraction between Almâsy and Katharine. Furthermore, the mise en scène adds more foreshadowing: Almâsy is literally (i.e. spatially) depicted coming between Katharine and Geoffrey in the same shot. The framing, camera position, and selective focus position the three characters in the same frame, but does not unite them. Instead, these elements of the film discourse signify the future dramatic conflicts that are to unfold. Again, the same-frame heuristic and the commentative heuristic are relevant to an analysis of this film. In the following scene, however, a number of the Sand Club members take turns to dance with Katharine. The shots of Almâsy and Katharine dancing are briefly interrupted by an insert of Geoffrey, who occupies the foreground, while Katharine and Almâsy occupy the background with other dancers. Again pull focus is used (this time very quickly) to shift focus from the background to the foreground. Geoffrey's expression, as he turns away from the dance floor, shows signs that he is uncomfortable with Almâsy dancing with Katharine. But there is no dialogue to suggest his unease. Instead, his feelings are conveyed simply by inserting the shot of him into the scene at the right moment. In the scene where Geoffrey temporarily leaves to take aerial photographs, an additional exchange of looks between Almâsy and Katharine is depicted. As Geoffrey leaves, Almâsy advises him not to leave Katharine behind in the desert environment. Geoffrey simply asks him why 'you type of people are threatened by a woman', and walks away. The scene ends with an exchange of looks between Almâsy and Katharine. We cut from behind Almâsy's shoulder to behind Katharine's shoulder. However, they are at least 200 feet apart. Each in turn appears in the foreground and extreme background. Such an unusual spatial disposition (reminiscent of the extreme shot/reverse shots in Citizen Kane) is ambiguous: using the expressivist heuristic, we can argue that the huge space covered by the shot/reverse shot can signify either that the two of them are still far apart emotionally, or that they are fated to come together with the temporary absence of Geoffrey. One of the most significant scenes where the same-frame heuristic can be used to analyse the ménage à trois is the International Sand Club's farewell dinner scene. By this time, Katharine has attempted to end her affair with Almâsy. Furthermore, everyone around the table appears" to know that the affair took place. Almâsy turns up late to the dinner, and is very drunk. 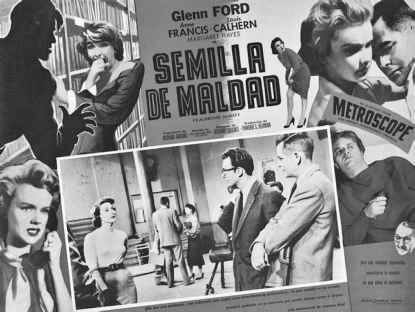 The main characters (Almâsy, Katharine, Geoffrey, Madox) are primarily isolated in single shots. But on three occasions Katharine is filmed in profile with Geoffrey in the background. Selective focus is used, and Katharine is kept in focus on all three occasions, while Geoffrey is out of focus in the background. On two occasions Geoffrey is filmed in profile in the foreground, with Katharine in the background. Selective focus is again used to construct these shots. However, Geoffrey is in focus in the first shot but out of focus in the second. The first of these 'profile' shots occurs when Almâsy directs a question to Madox, who is sitting between Katharine and Geoffrey. The shot consists of Katharine in the foreground, Madox in the middle ground, and Geoffrey in the background. However, even though the question is directed to Madox, he does not dominate the frame, and is out of focus (only Katharine is in focus). A conventional way to film Madox would be to continue filming him in isolation in his own shot. But Seale's deviation from this standard is conveying, via cinematic elaboration, the distance between Katharine and Geoffrey, plus Madox's attempt to mediate. The second 'profile' shot is the reverse of the first, with Geoffrey occupying the foreground, with Katharine in the background. Madox has left the table to try and control Almâsy. Although Geoffrey is in the foreground, he is out of focus; only Katharine, in the background, is in focus. The third profile shot repeats the first, except that Madox is still absent. But the focus remains on Katharine. The fourth shot repeats the second, with Geoffrey in the foreground and Katharine in the background. Madox is shown sitting down, occupying the middle ground. However, the focus has now switched from Katharine to Geoffrey. The fifth and final profile shot repeats shot 1 with Katharine in the foreground in focus, Madox in the middle ground, and Geoffrey in the background. In keeping with his dislike for unnecessary camera movement, Seale has decided to use a still camera and selective focus rather than, say, a panning movement from Katharine to Geoffrey (or vice versa). In the interview in American Cinematographer, he indicates why he used framing and focus in these profile shots: 'We never related the two [Katharine and Geoffrey] by pulling focus. In fact, we isolated them by not pulling focus. I love that. It visually tells the story of these two -the infidelity between them' (quoted in Oppenheimer 1997: 37). This is the first scene where we see Almâsy and Katharine together after she has attempted to end the affair. The camera focuses on Geoffrey's and Katharine's individual reaction to Almâsy's presence and comments. In the previous moments mentioned above, we have detected a discrepancy between Katharine's and Geoffrey's reactions to Almâsy, from the first meeting in the desert to the scene where Geoffrey flies off, leaving Katharine in the desert with Almâsy. Only the inserted shot of Geoffrey reacting to Katharine and Almâsy dancing has previously indicated any discomfort he may feel, but the shot is ambiguous and brief. In the five profile shots, both Katharine's and Geoffrey's disapproval of Almâsy is clearly evident, although their disapproval is not united (we only experience their disapproval separately, even though they appear in the same shot five times), and Katharine's disapproval is privileged over Geoffrey (Katharine is in focus for four of the five shots). The sequence is in keeping with the previous scenes mentioned in this section because it continues to emphasize the emotional conflict and tensions the main characters feel - particularly Katharine, who is in love with two men at the same time. Furthermore, these two men are sitting around the same table with her, and the scene is focusing on her unspoken reactions and conflicts.